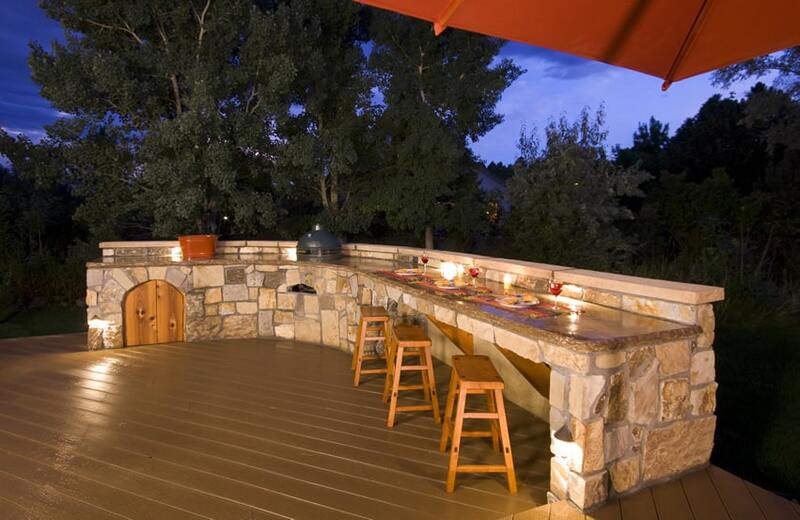 Welcome to our gallery of outdoor kitchen ideas. 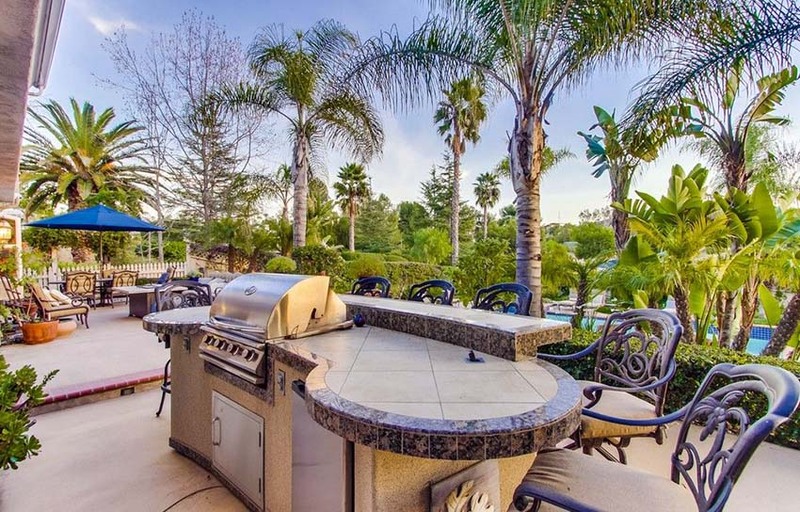 An outdoor kitchen area is a great way for you and your family and friends to extend the joy of cooking and eating a delicious meal from your home’s backyard. 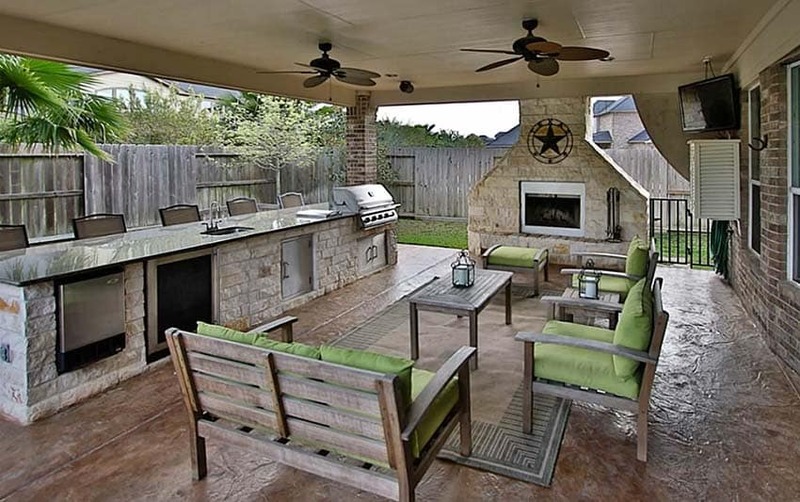 While an outdoor barbecue area can simply be an area of your porch or patio where you’ve set up a comfortable seating area and a grill, an outdoor kitchen is often set up with much of the functionality of an indoor kitchen. Your outdoor kitchen area is a permanent kitchen where you can place gas grills surrounded by built-in cabinets and counter space. You can even install sinks, storage areas and have room for other appliances such as refrigerators or wine coolers. A good outdoor kitchen design should have plenty of prep room and this includes room to set down utensils and ingredients. Don’t forget to leave space or a small amount of room between the cooking area and the dining area to make sure your guest’s don’t feel the heat from the grills. A well designed kitchen area needs to factor in safety followed by functions for an aesthetically pleasing outdoor living space. 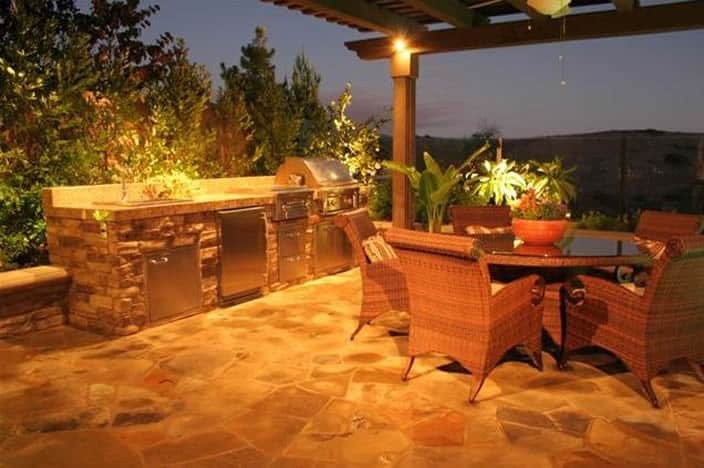 An outdoor barbecue area should be made up of a lot of flame and heat resistant materials, such cement, brick, stone or ceramic tile. Make sure to have a clear area around the grill so that an accidental spark won’t harm your plants. If you live in a moderate climate, as long as you take care to use weather-resistant materials, you can have an outdoor kitchen all year long. Also make sure to have a roof structure to shelter the area and your guests from direct sun and rain so you can really enjoy outdoor cooking whenever you want. 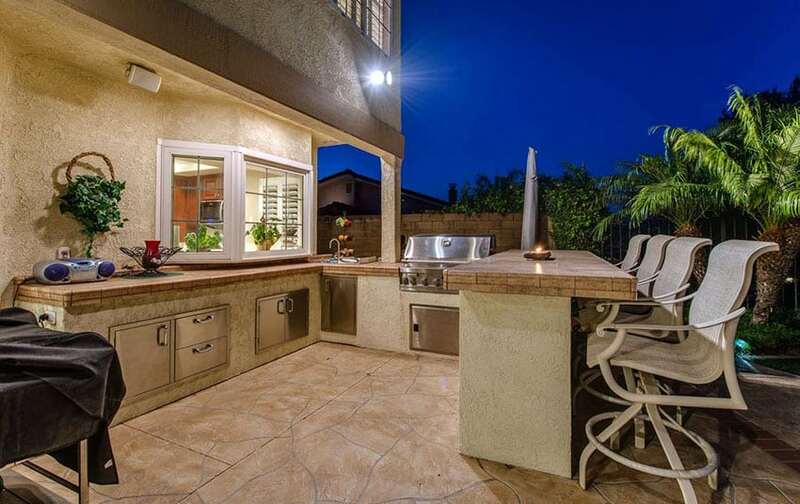 Located at a nice a outdoor patio, the outdoor kitchen is strategically placed at a wall covered by the roof eaves, protecting most of the cabinets/appliances installed. As it is an outdoor kitchen, it is essential to use materials which can withstand weather exposure, and in turn, this kitchen has stainless-steel cabinets and drawers, with black countertop, creating a sleek and modern outdoor kitchen. 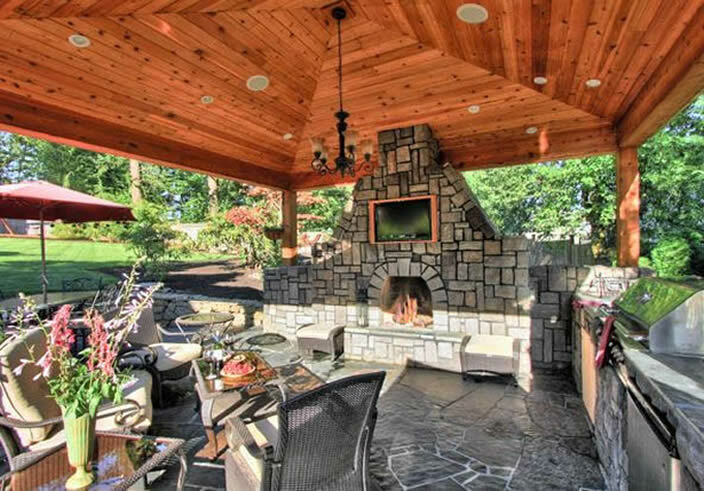 This outdoor kitchen has the benefit of being under a covered porch with vaulted ceilings. The long kitchen counter allows for plenty of seating opportunities as well as room for appliances like a dishwasher and wine refrigerator. An outdoor fireplace completes the design and provides a great spot for night time socializing. As an outdoor kitchen located in the paved backyard, this set-up needs a more weather-proof construction as it is more exposed to weather. The kitchen counters are built from concrete and are painted in a yellow color, with black granite counter top. 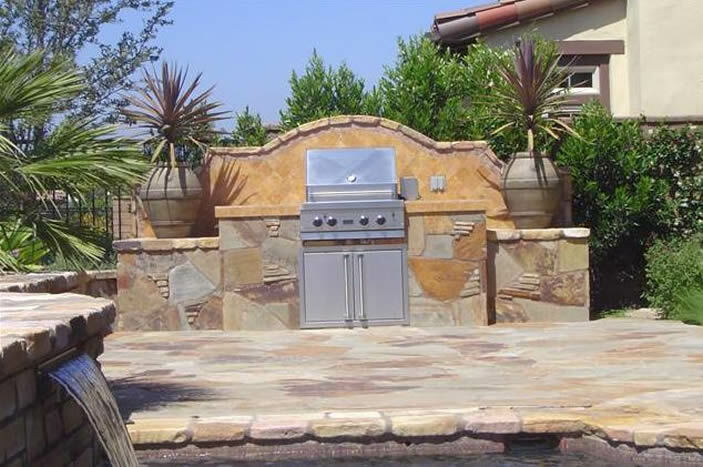 You will see and install outdoor stove and grill, as well as a concrete kitchen island. The rustic quality of the finishes matches with the over-all aesthetic of its setting. 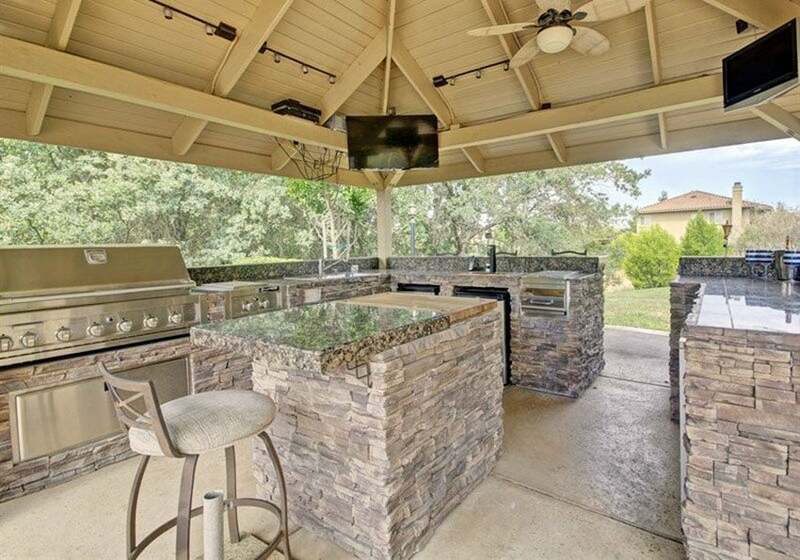 This U-shaped outdoor kitchen is attached to the home with a long peninsula running out with bar stool seating. A bay window looks directly out from the house on to the flagstone patio. 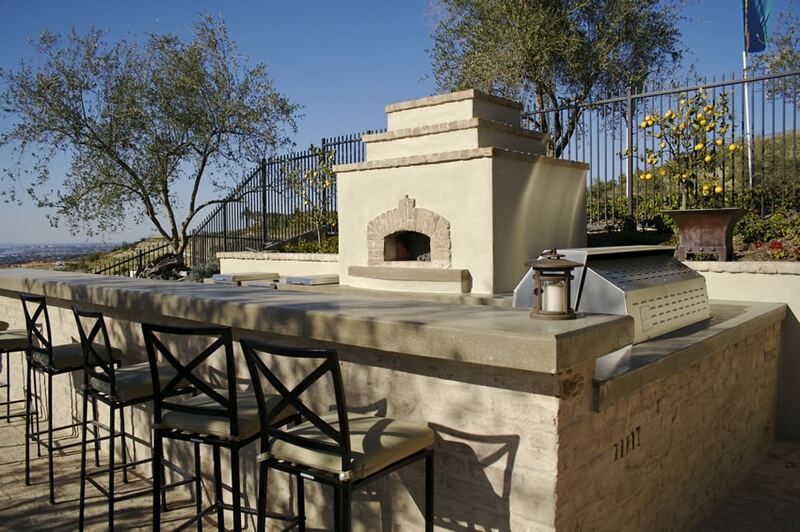 Overlooking the swimming pool is an ideal place for this outdoor kitchen with curved countertop and bar stool seating. The countertop features a two tiered design with a higher ledge for those sitting at the bar stools and a lower countertop for food preparation. 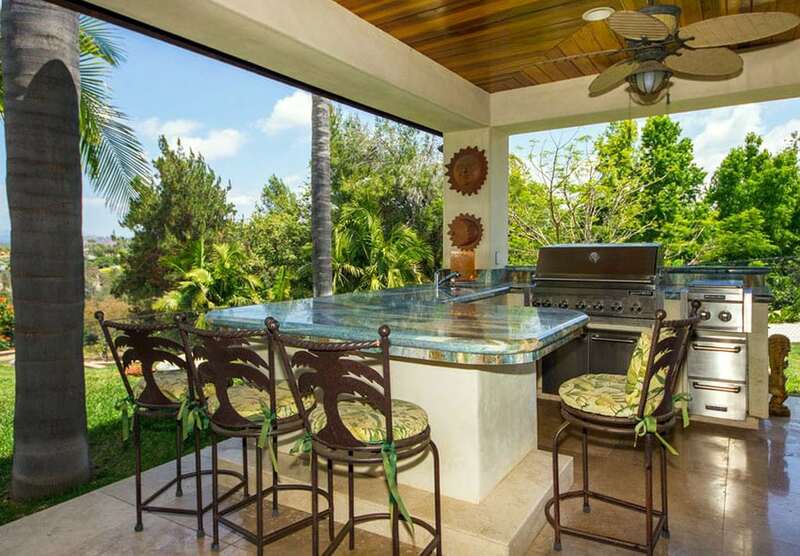 This tropical outdoor kitchen certainly captures the islander theme with its bright granite counter peninsula bar equipped with palm tree bar stools with decorative cushions. The covered porch is wired with a fan to help with air circulation and help keep things cooler. 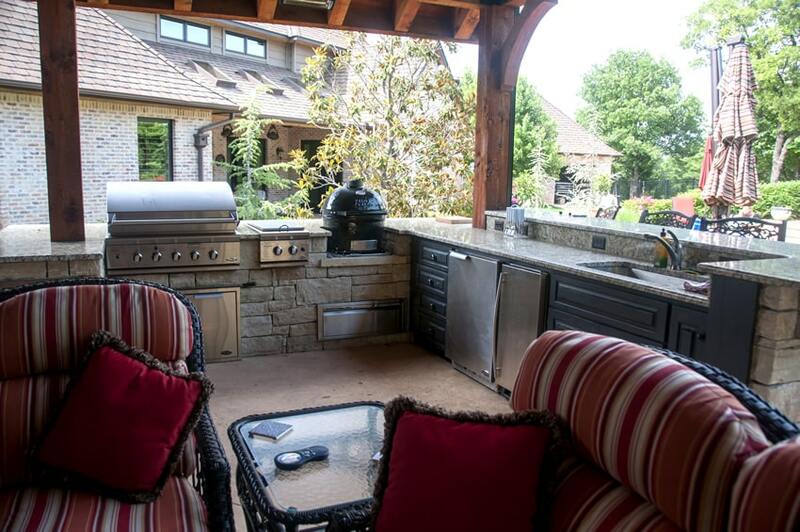 This covered outdoor kitchen with has a small center island with a butcher block on one side for food preparation and a thick slab of granite on the other as a breakfast bar. The covered patio’s vaulted ceiling hosts a couple television sets for catching the game while cooking. 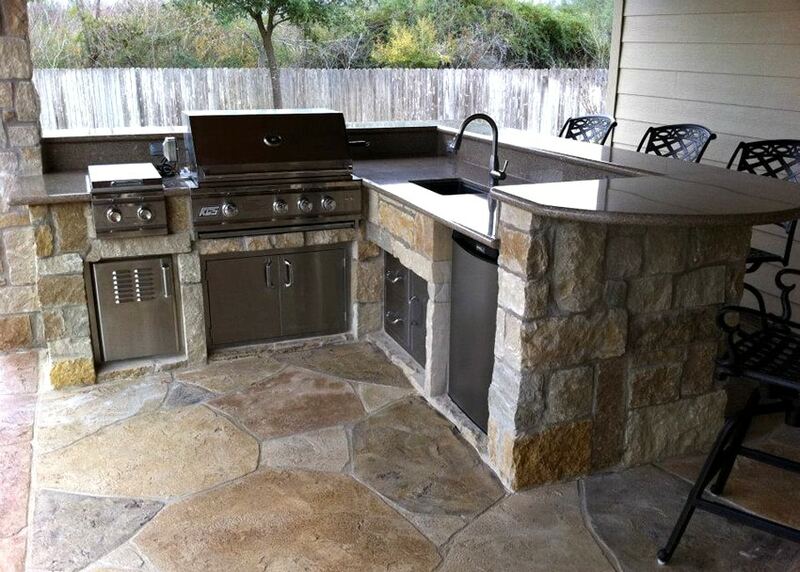 This L-shaped outdoor kitchen may be smaller but it is packed with everything a grill master may need. The kitchen itself is constructed from rough stone with a concrete countertop. This contemporary outdoor kitchen features travertine tile countertops with stainless cabinet doors for plenty of under counter storage. 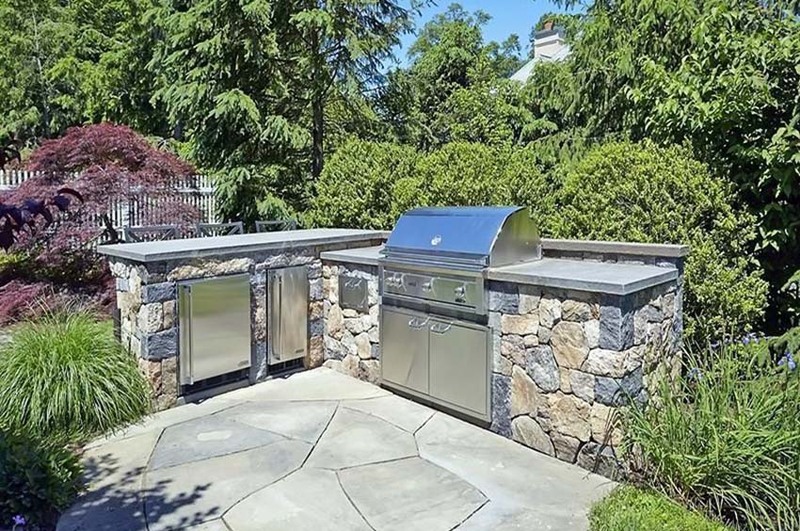 Being in a completely exposed location, the construction of this outdoor kitchen ensures it will not rot away with exposure from harsh weather conditions. The L-shape counter is constructed from concrete with brick cladding and topped with a solid stone counter top material. The appliances, like the grill, are all in stainless steel, while the bar stools are of coated aluminum, both of which are good materials for use outdoors. 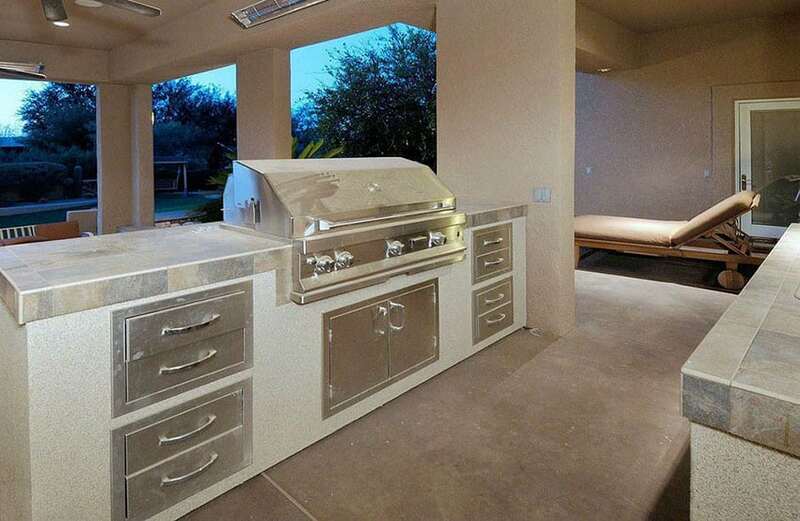 This outdoor kitchen has quite a unique layout. 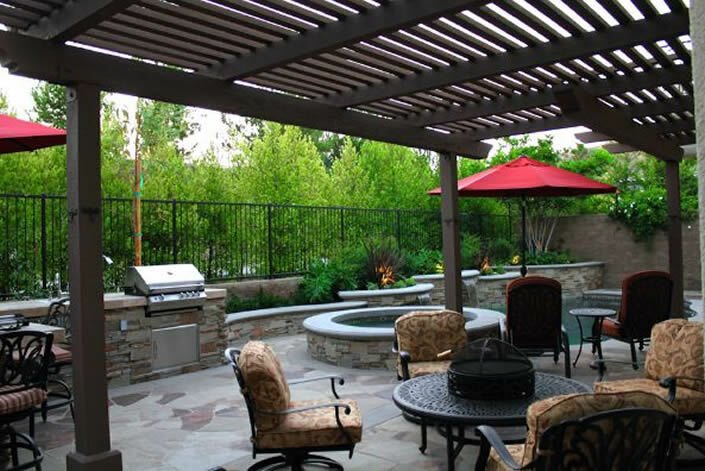 Three-quarters of the outdoor kitchen set-up is covered under the roof eaves, while the rest of the kitchen is covered by the patio’s awning. Most of the appliances like microwave, refrigerator are kept under the eaves, inside the recessed areas of the wall. Smacked right in the middle is a long kitchen island made is made from concrete keeps its raw concrete finish and topped with white solid surface. This gives you a durable and weather-resistant island counter which also matches the modern aesthetic of the space. 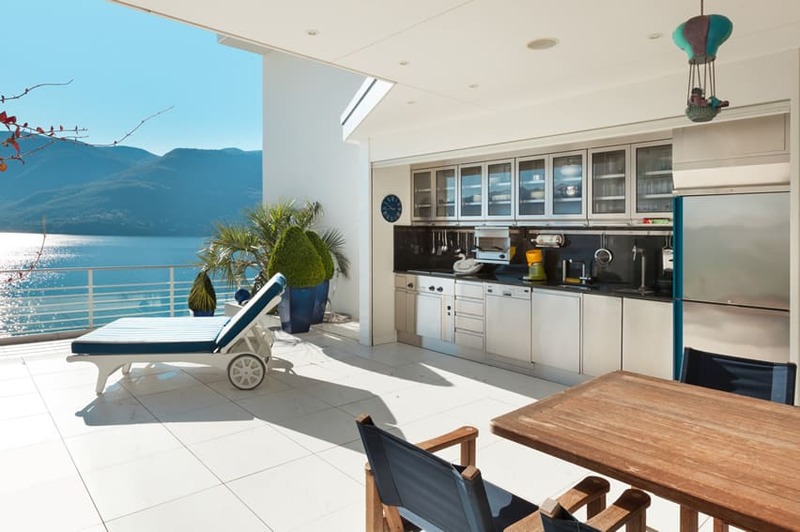 Set on a Mediterranean-style home, the outdoor kitchen is connected as part of the architectural structure and therefore does not deviate too much from the style of the house. 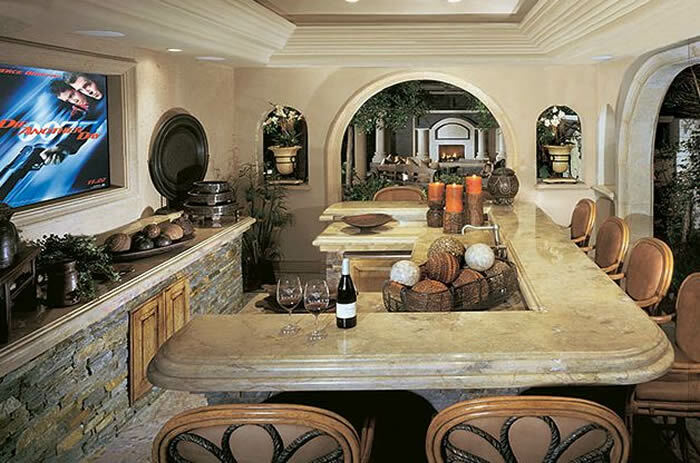 The kitchen counters are connected to the low walls and are made from concrete and painted in the same beige tone used on the main walls and the columns, as the kitchen is mostly exposed. The counter top is also made from concrete but finished with a smoother concrete finish. 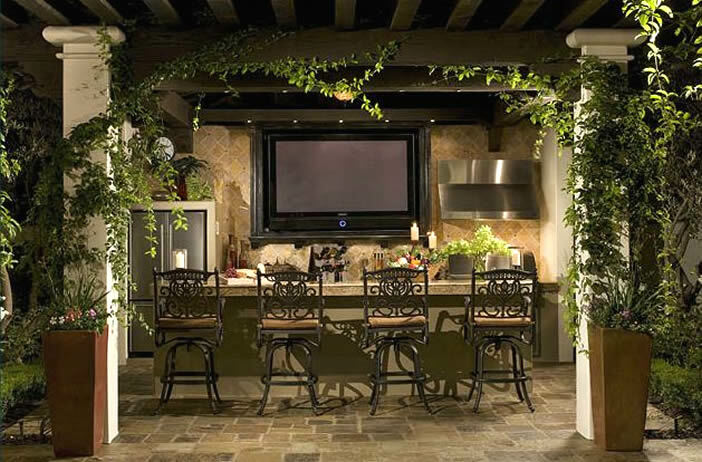 This outdoor kitchen is located at the covered patio so it is not too exposed to moisture and other hash weather elements. Despite being in a covered area, it is still made of pure stainless steel – the carcass and the doors and all appliances, so that it would be easy to clean and maintain, and would be able to withstand outdoor exposure. 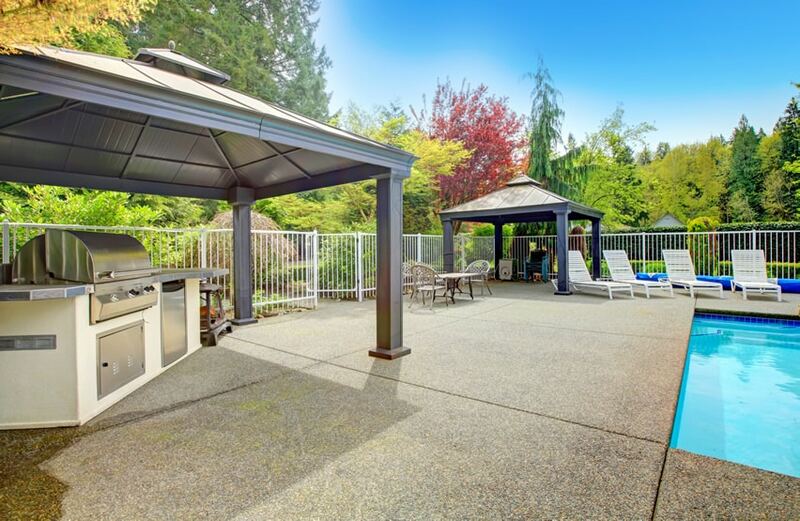 Tucked in a small garden patio with a covered trellis, this outdoor kitchen is perfect for preparing outdoor barbecues. The base of the cabinets are constructed from bricks and is left in its natural color, while the cabinet doors are weather-proofed teak which matches the vertical teak planks on the fence. The counter top is concrete covered in dark gray ceramic tiles which is both practical and sturdy option for outdoor kitchens. 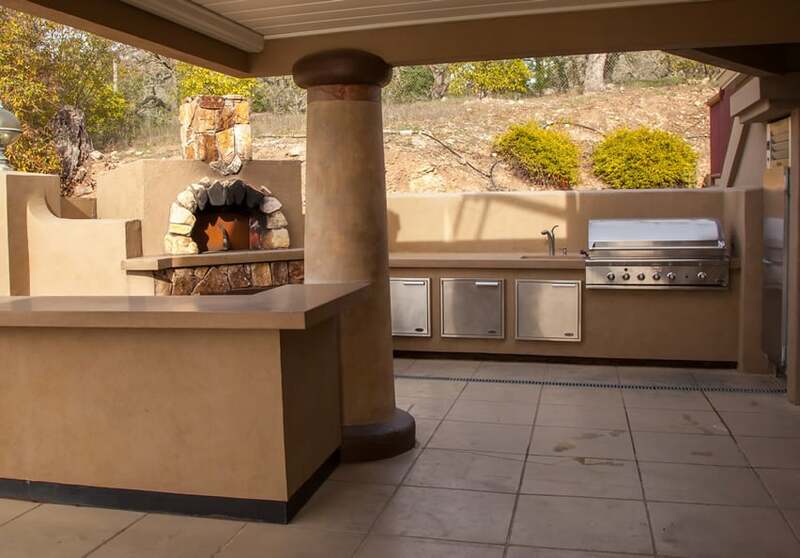 This outdoor kitchen is similar to the Mediterranean example. as it is connected to the architectural structure and adapts the same finishes. It is safely covered in the patio area, and the kitchen counters are all from concrete and finished with the same stone cladding as the walls. The cabinets and appliances are safely tucked into recesses on the concrete counters and topped with a nice beige granite stone. A built-in under counter wine refrigerator is a nice touch and great for socializing with friends. 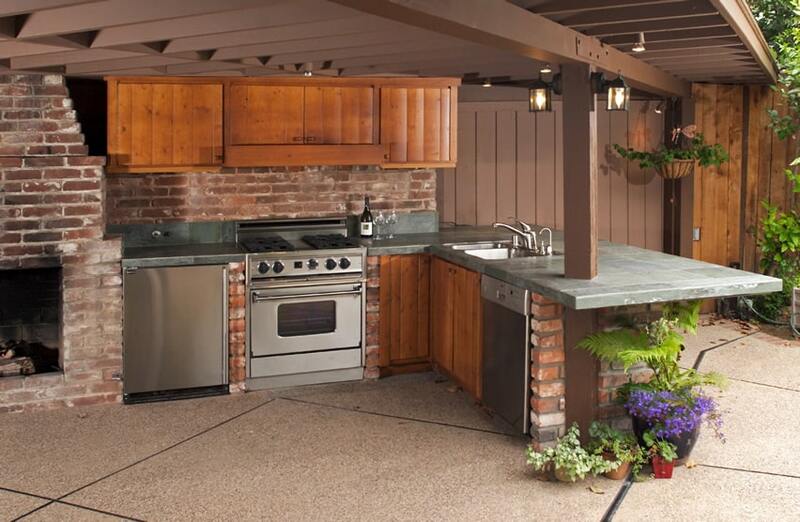 This outdoor kitchen is smaller than most of the examples here and is in a simple L-shape configuration. The size is reminiscent of mini bars. This is also made from concrete base with stone cladding in brick patterns so that it matches the finish of the patio flooring and also withstand the outdoors. All appliances are stainless steel, and the counter top is a unique red and black granite. This outdoor kitchen is quite unique, as it is oriented diagonally and is a stand-alone kitchen island as it doesn’t have a wall on its sides and is protected by a gazebo-like structure.The base is made from marine plywood so that it would not easily warp despite being exposed to moisture, and also to keep the kitchen island light so you can easily move it during extreme weather conditions. The counter top is also constructed from marine plywood and is clad with ceramic tiles. 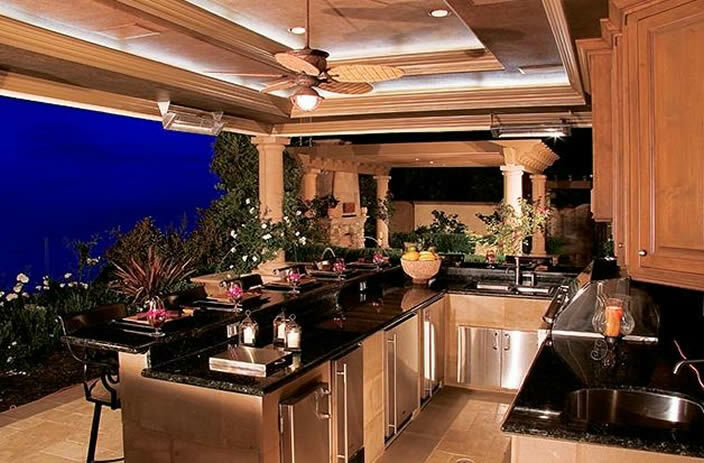 Usually, outdoor kitchens are mostly constructed from concrete and clad with bricks or painted, but this simple outdoor kitchen is constructed almost purely with large stones, and topped with beige granite. There is no fancy stainless steel appliances installed, and you will only one wooden cabinets other than the 3 teak wood stools. 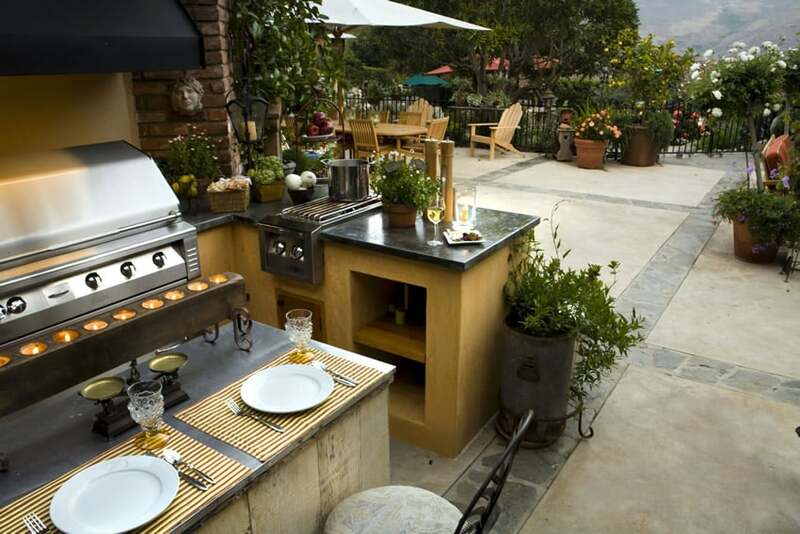 This outdoor kitchen is constructed from blocks of stones, and uses stones cut into standard sizes. This is not connected to the house/structure but is stand-alone on the gazebo, and is instead connected to the outdoor fireplace. There is a roofing to protect it from most outdoor elements so it is fitted with stainless steel appliances. 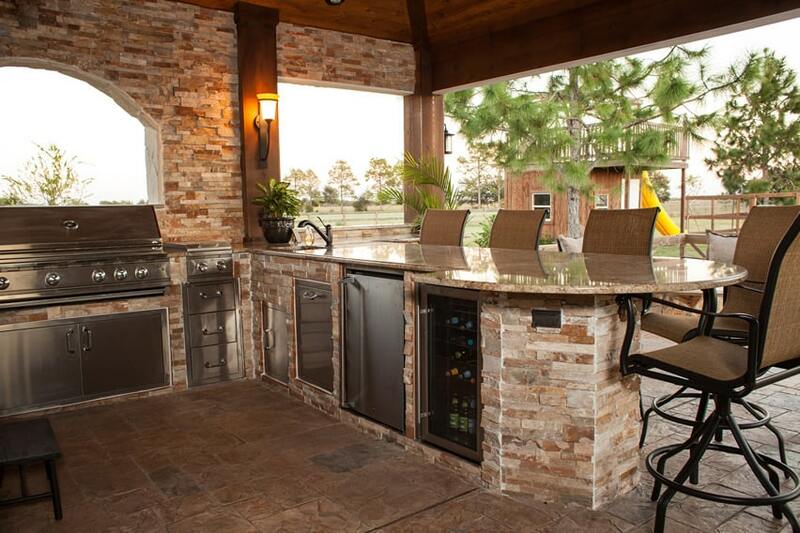 This is a full-sized outdoor kitchen with a U-shaped counter, complete with a bar counter for dining purposes. As it is well-covered, it won’t be too exposed from moisture, but as it is, the base cabinets are still made from concrete and topped with sandstone tiles and black galaxy granite counter top. Built-in cabinets and appliances are all in stainless steel, and the upper cabinets on one side are the only wooden elements. In this view of the kitchen, you will see how the kitchen is placed in an ideal middle spot between the pool and the outdoor dining/lounge area, making it a perfect entertainment space. You will also see that the upper cabinets of the kitchen has a flat screen TV hidden behind the cabinets, so you can keep it inside and safe from outdoor elements when it is not in use. Compared to the other kitchen examples here, this one has a heavier massing due to the general form of the kitchen as well as the choice of finishes. It has a large U-shaped island and a counter against the wall, all of which are constructed from concrete and topped with slate tiles, giving it an outdoor feel and a good amount of texture. The counter top is an off-white granite tone, with nosing detail which gives an illusion of volume, making the counters look thicker than they really are. One notable feature of this kitchen would be the Flat TV screen attached on the recess of the outer wall and “framed” with white molding. 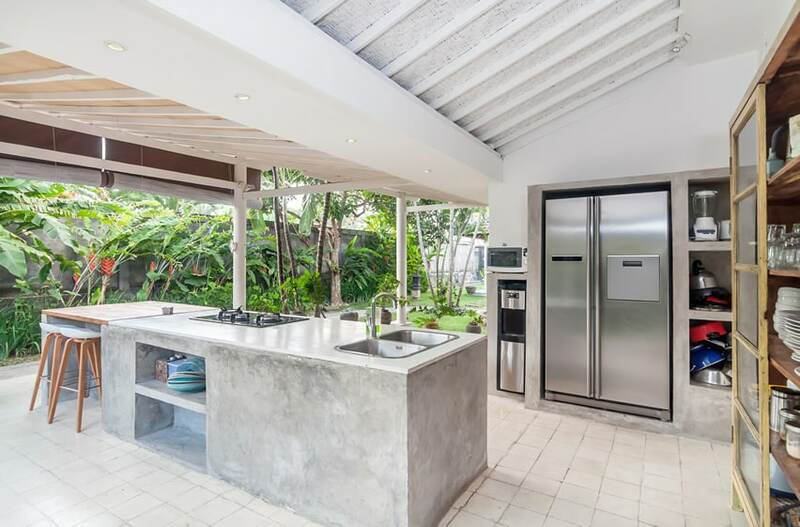 A partially-covered outdoor kitchen which has a uniquely-shaped counter blends itself with the architecture of the space by adapting the same architectural finishing. The counters are attached on one of the columns of the patio roof/awning, and adapts the same masonry stone finish on the concrete counters. The counter itself has a unique shape, in which the end of the “J” shape of the counter terminates in a circle, which serves as the dining area. 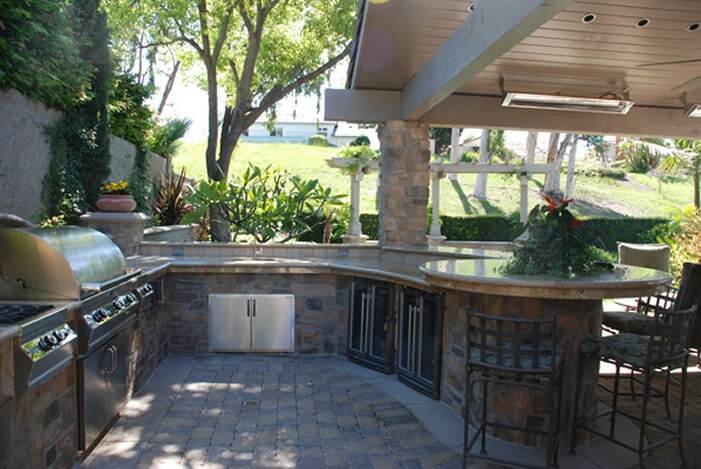 This outdoor kitchen has a nice outdoor patio setting surrounded by a garden. It has a simple gallery kitchen with a rectangular bar counter/island and the counter base is made from concrete and painted with a nice sage green color which perfectly blends with its setting. The wall of the gallery kitchen is diagonally tiled with outdoor-grade natural finish tiles, and has a large LCD TV in the middle, framed by black-painted molding. This is a good simple outdoor kitchen set-up, complete with outdoor kitchen essentials, but doesn’t take up too much space. 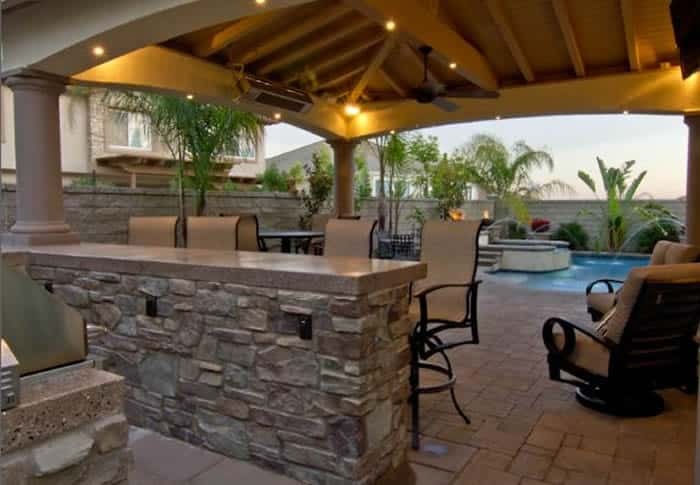 Placed in an outdoor patio area, it shares the space with an outdoor dining set, so to save space, it is placed on the outer edge of the patio, blending with the outdoor finishes as it has masonry tile finish on the base cabinet. The counter top material is beige granite with a wide fascia to make the counter look more thick and solid. 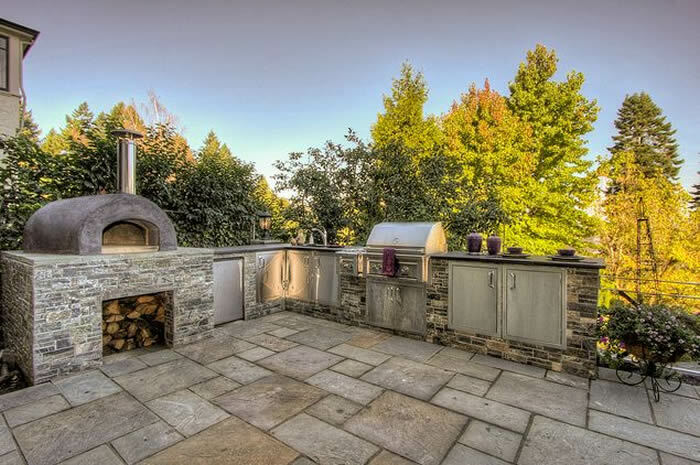 A uniquely designed outdoor kitchen placed in the middle of the open patio area. 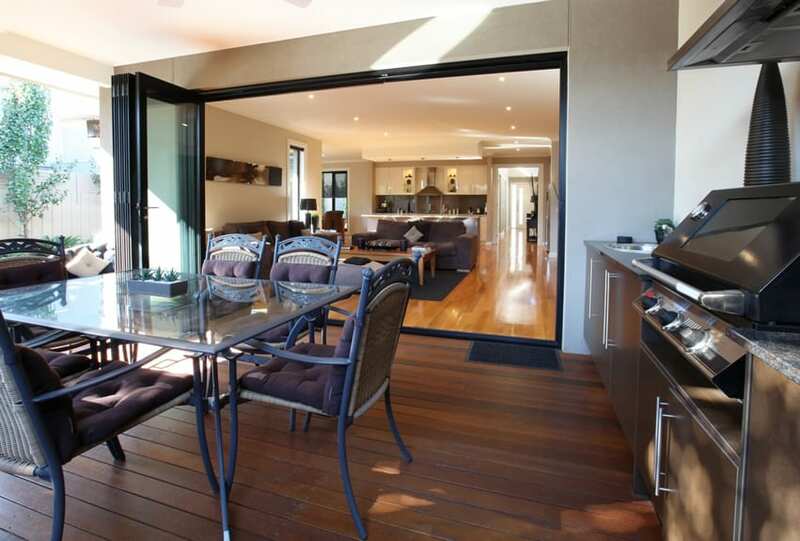 You will notice that a quarter of the kitchen intersects with the elevated area of the patio. It is in a simple U-shape kitchen layout and made from concrete painted in a nice off-white/beige color and topped with a simple dark gray solid surface material with a thick fascia for that modern look. You will also notice a built-up wall for the main counters, in which there is a recessed area for the main counters, upper cabinets and lighting which will be handy during night barbecues since this patio will not have ceiling lights as it is open. Basically, this kitchen is almost indoors as it is inside a well-covered patio area. But as it is still exposed from moisture and other outdoor elements, it still uses that sturdy concrete construction for its base and then covered with masonry tile cladding which matches the finish of the fence. The counter top material is a thick light beige quartzite. A very simple and utilitarian outdoor kitchen which perfectly matches the modern Asian zen theme of the garden. 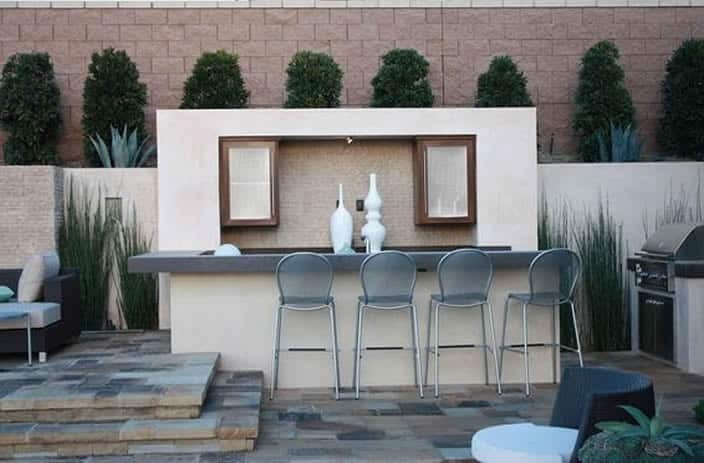 The counter is fully concrete, keeping its light gray concrete finish and topped with a very light gray quartzite stone counter and fixed with an outdoor grill. This small set-up stands out nicely because of the nice black-tiled accent wall behind it. This outdoor kitchen blends seamlessly in the small pocket gardens as it is attached directly on the low concrete framing of the pocket gardens. It also uses the same finish of crazy cut stone cladding, giving it a nice durable finish appropriate for the outdoors. 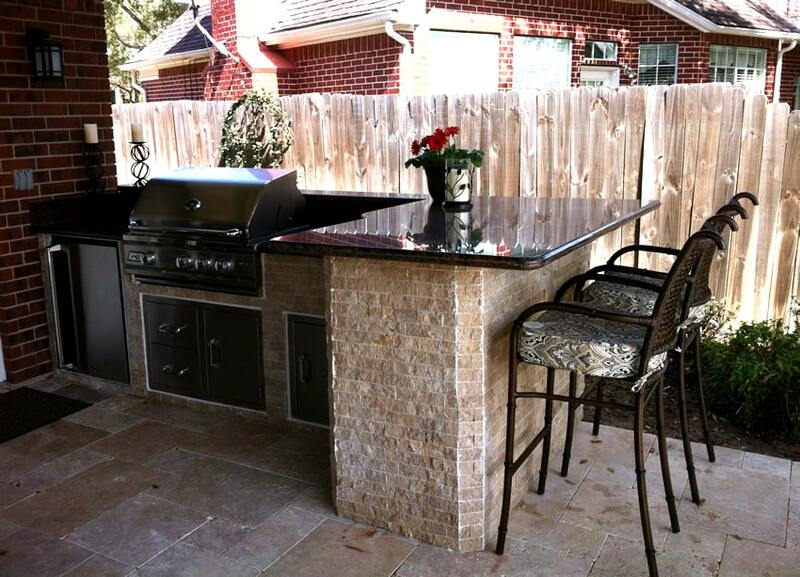 The counter top is tiled with light red ceramic tiles, and it is fixed with an outdoor grill. 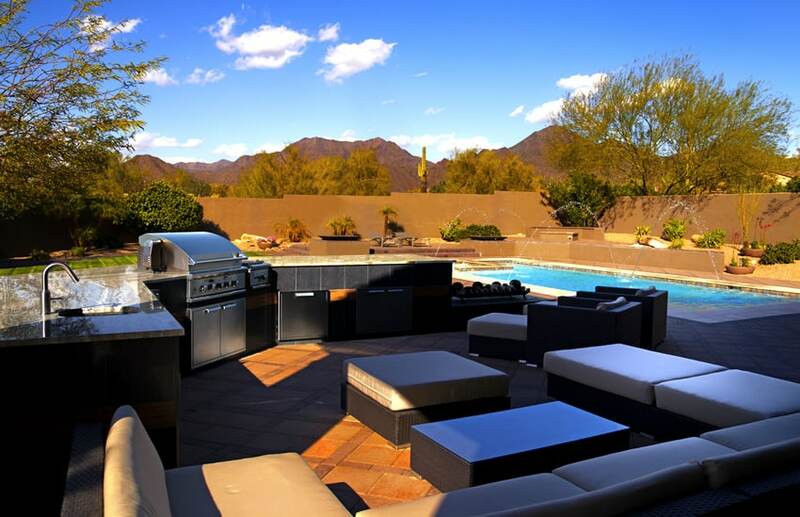 This outdoor kitchen is out in the open and exposed from much moisture and other outdoor elements, so it was designed to blend with the landscaping of the pool area. Like the flooring material, the kitchen counters are finished with variously colored natural cut stones, and instead of using fancy polished granite for its top, it also uses the same thick slabs of natural stones. A simple L-shape outdoor kitchen with a masculine feel. The concrete counter is finished with gray stone cladding which matches the gray concrete pavers well. The counter top is black granite which adds to its masculine appeal as well. It has stainless steel appliances and cabinet doors, and it is also fixed with an outdoor oven made from concrete. Instead of using faux stone cladding placed on the concrete cabinet base, this small outdoor kitchen achieves a more natural look by constructing the base of the counters from the same natural-cut stones as the structure’s outdoor columns. To give it a cleaner look, the counter top is fixed with a dark brown granite material, polished to perfection with a simple round edging. 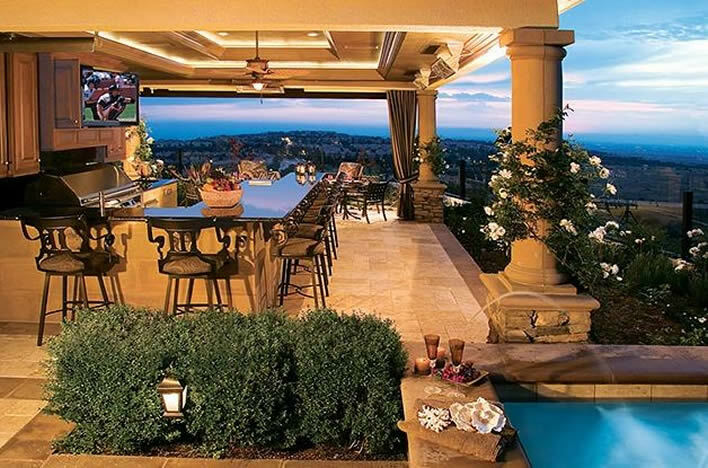 This is a very large outdoor kitchen set-up which has a full-sized dining set to complement it. The kitchen counters are all against a full-height wall and is made of concrete base, but retains a rough finish and painted over with the same light brown shade as the walls. The counter top material is black granite with golden specks, and the cabinet doors are laminated in a dark wengue shade instead of the typical stainless steel doors found on outdoor kitchens. 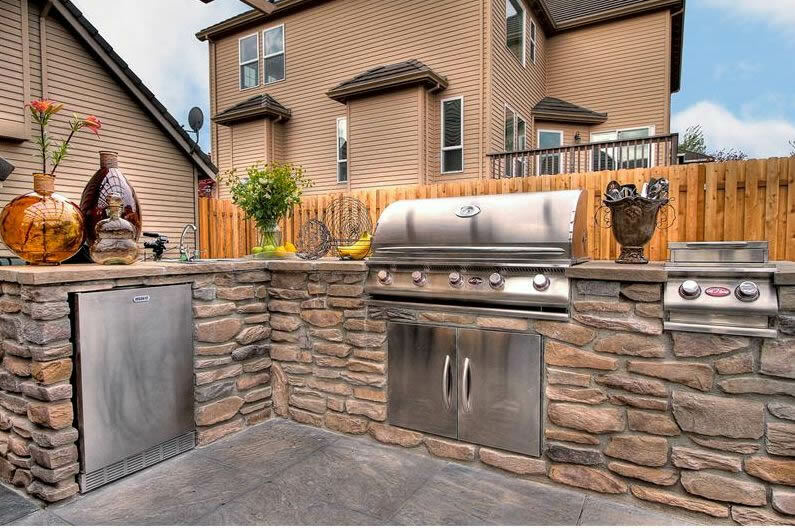 You will also notice that the wall behind the grill is clad with stainless steel and has a large filter-type exhaust on the top to prevent discoloration and warping of the ceiling. This outdoor kitchen is very simple – it has a concrete base, tiled with dark blue tiles, topped with beige granite counter top and fixed with stainless steel cabinet doors and appliances. The simple counters matches perfectly with the outdoor furniture which has black synthetic rattan base and beige-upholstered cushions, unifying the lounge and kitchen area. 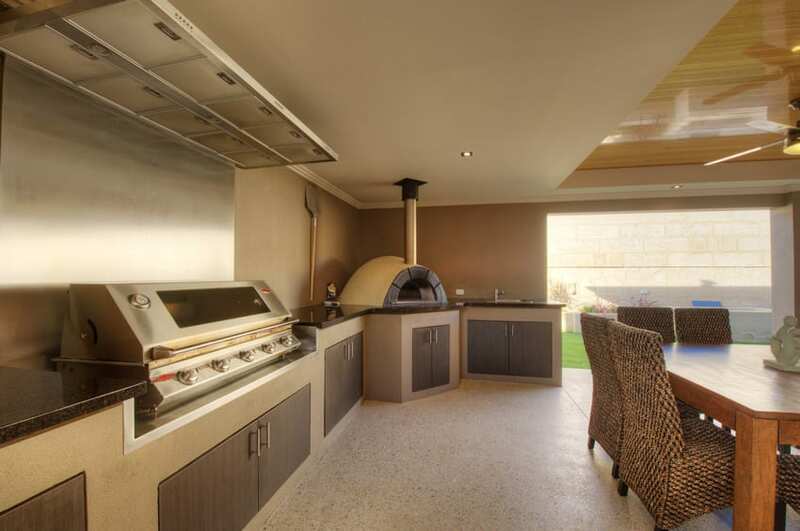 Outdoor kitchen ideas that are simple and durable are highly sought after to prevent damage caused by sun and adverse weather conditions. This L-shape outdoor kitchen uses natural stones typically used in outdoor posts/columns and uses it as the base structure of the counters, creating an outdoor kitchen which is not alienated from its outdoor setting. The counter top uses natural cut stones as well, and the appliances fixed on the recessed are all in stainless steel so it would be able to withstand its outdoor placement.